Santa Barbara County is a fairly large coastal county situated just where the California coast takes a sharp eastern turn at Pt. Conception. From here south the southern California beaches are mostly sandy and attract sun worshipers in the summer. The town of Santa Barbara, and its college suburb Goleta, are laid-back communities of sunshine, flowers, and Spanish architecture. Santa Barbara County itself has a much broader spectrum of habitats. It has coastal lagoons, extensive agricultural bottomlands in the Santa Maria River valley, lots of oak woodlands and chaparral, and mountain ranges topping out in pines at Big Pine Mountain (6828 ' elev = 2101m). It has many vagrant traps along the coast, and numerous major rarities appear on the county checklist (including the State's first Little Curlew in ). Santa Barbara was among the original 27 counties and was then significantly larger; Ventura County was created from its eastern stretches in 1872. Its namesake island — Santa Barbara Island — stayed with Santa Barbara County at this split, even though it is much closer to the Ventura coast, creating anomalies in offshore lines for county birders. The other Channel Islands assigned to Santa Barbara County are San Miguel, Santa Rosa, and Santa Cruz islands [see the separate Channel Islands page]. County birding statistics and links are on Joe Morlan's site. 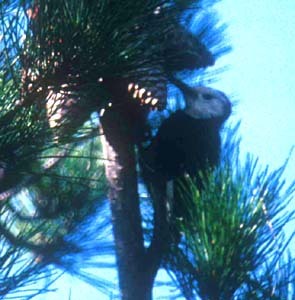 Paul Lehman's 1994 Birds of Santa Barbara County is the standard status & distribution reference. Jamie Chavez's Birding in Santa Barbara County is a good on-line introduction. 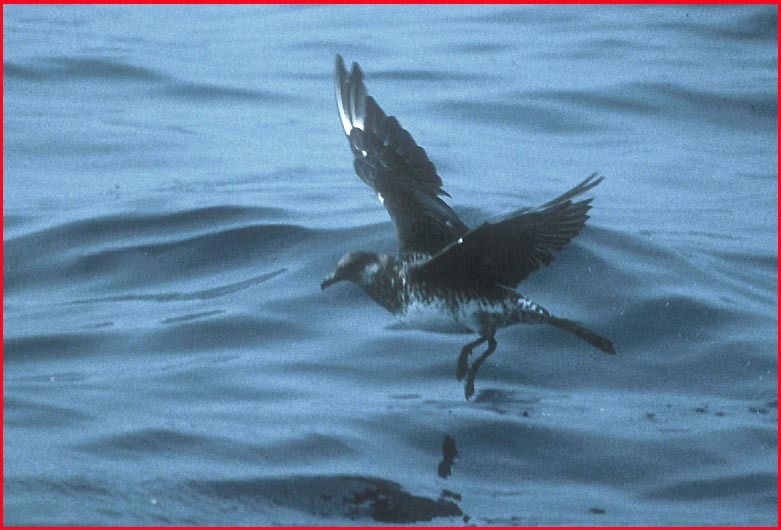 For Santa Barbara County my best local photos so far are of pelagics; featured is an adult Pomarine Jaeger, one of 38 seen on this winter boat trip over deep ocean waters in hopes of rare winter alcids (we glimpsed what were probably Parakeet Auklets but did not have decent views). Because Pt. Arguello and Pt. Conception dominate geographically at this corner of the shore where it turns eastwards, a huge swathe of ocean is assigned to Santa Barbara County as the nearest point of land. 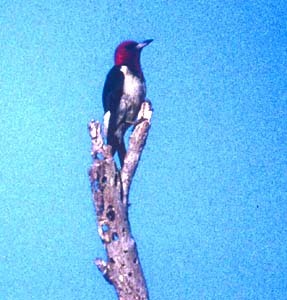 I have also chased and seen a goodly number of vagrants along the coast of Santa Barbara County; here are two rare woodpeckers: Red-headed — a major rarity anywhere in California (14 Sep 1988 at Goleta) — and White-headed, of much more local interest in the lowlands (31 Jan 1988 at Lake Cachuma).